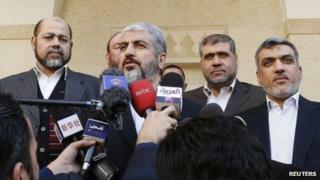 The political leadership of the Palestinian Islamist group, Hamas, has moved from Syria to Egypt and Qatar. Deputy political leader Moussa Abu Marzouk, now based in Cairo, said Hamas could not operate effectively due to the unrest in its long-time ally. The political leader, Khaled Meshaal, and his aides have moved to Doha. On Friday, the head of the Hamas government in Gaza, Ismail Haniya, declared his support for Syrian people against President Bashar al-Assad. "I salute all people of the Arab Spring, or Islamic winter, and I salute the heroic people of Syria who are striving for freedom, democracy and reform," Ismail Haniya told worshippers at a mosque in Cairo. The worshippers shouted back: "God is great" and "Syria! Syria!" The remarks reflected the deepening split between Hamas and Mr Assad. The political bureau of Hamas - which is designated a terrorist organisation by Israel, the US and EU - moved to Syria in 1999 after the Jordanian authorities accused the group of using the country as a base for illegal activities and briefly detained Mr Meshaal and a key aide. The Syrian government welcomed the group, providing its leaders with a safe haven, and helping to supply it with weapons and money for the armed struggle against Israel, with which Syria is still technically at war. Relations appeared to be good until anti-government protests erupted throughout Syria in March 2011, triggering a violent crackdown by security forces which activists say has left more than 7,000 people dead. Hamas initially neither publicly endorsed the Syrian regime's handling of the uprising - reportedly much to Mr Assad's anger - nor repudiated it. Analysts said the Sunni Islamist group was torn between risking the support of its main financial backers - Syria and its ally, Iran - and supporting Syria's majority Sunni community, which has borne the brunt of the crackdown by the Alawite-dominated security forces. Mr Abu Marzouk told the Associated Press on Sunday that Hamas still had offices in Syria, but acknowledged that "practically, we are no longer in Syria because we could not practice our duties there". "Our position on Syria is that we are not with the regime in its security solution, and we respect the will of the people," he added. He said Hamas wanted to keep its ties with Iran, but stood up to the government in Tehran in refusing to publicly support President Assad. "The Iranians are not happy with our position on Syria, and when they are not happy, they don't deal with you in the same old way." A member of the Hamas political bureau recently said Iran had been the main financial supporter of the Hamas government in Gaza, and that without Iranian money it would not be able to pay its 45,000 employees. Mr Abu Marzouk also said that last year's agreement between Hamas and the rival Fatah movement to form a Palestinian government of national unity ahead of parliamentary elections still faced steep obstacles. A series of recent meetings between Mr Meshaal and Palestinian Authority President Mahmoud Abbas did not lead to any breakthrough.